Manchester City boss Mark Hughes will fly out to Abu Dhabi on Tuesday evening for talks with owner Sheikh Mansour Bin Zayed Al Nahyan. There has been renewed speculation over Hughes' future, despite club denials that he may be replaced. "There is no 'situation' - this meeting was planned weeks ago," an Eastlands spokesperson told BBC Sport. It will be the duo's first meeting and the timing is unfortunate for Hughes, following three straight league losses. City are just one point off the Premier League relegation zone, which is hardly the form the club's owners had hoped for after pumping £76m into transfers in the summer. Chairman Khaldoon Al Mubarak issued a statement assuring Hughes that his job was safe on Monday. "We are calm and under control and we have the highest regard for Mark," he said. "This is a winning team that is going through a learning curve. While January is going to be an interesting opportunity for Mark to improve the team, this is an exciting 10-year dynasty that we are building and we are only in the first two months." Hughes will fly out to Abu Dhabi with City executive chairman Garry Cook. They will meet Sheikh Mansour on Wednesday, before returning to England so that Hughes can attend training at City on Thursday. Cook dismissed stories questioning Hughes' future at the club when he spoke at Eastlands before flying out to Abu Dhabi on Tuesday. "There is speculation in the newspapers, but that's what they do," he told BBC Sport. "We are building a football club for the future. We have a close-knit group of people at this club." 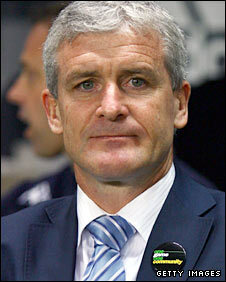 Hughes was appointed City's manager in July, when former Thai prime minister Thaksin Shinawatra owned the club. Sheikh Mansour's Abu Dhabi United Group completed its takeover of City on 23 September. City say this is the first opportunity the duo have had to meet, as the club does not have a midweek fixture this week and Sheikh Mansour is not on state business. The Sun newspaper claimed on Tuesday that Inter Milan manager Jose Mourinho had been lined up to replace Hughes, a claim that the club vehemently denies.